For small all wheel tractors. Planting machine featuring smaller construction. Type series Champion features a hydraulic planting depth adjustment, a hydraulic lateral displacement and a circle planting system equipped by hydraulic wire drive. The planting system with hydraulic wire drive generates exact planting distances also when driving speed changes. If transversal lines shall be achieved planting might only be realized by one field side. Planting distances as of 40cm are possible by means of changing sprocket wheel planting distances are complying with tractor width. For all plants from 10 cm to 5 m length. 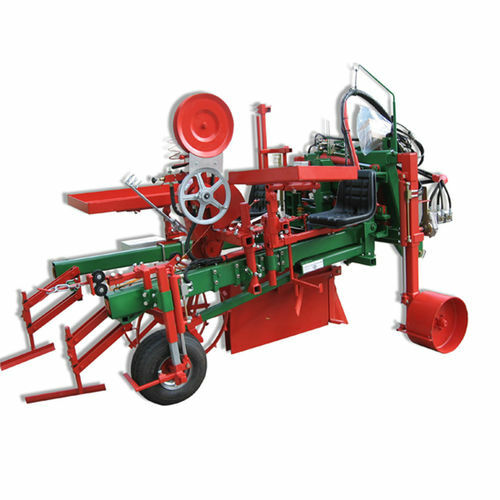 Depending on equipment and size of planting machine 4 construction types are offered. Qualified for straight forward control by means of laser. Special demands and requirements of customer might always and in anytime be considered. Develops and manufactures machines for viticulture and fruticulture.